We started setting up our stand at The Showmans Show today with a few bits left for tomorrow, obviously our stand looks good(!) but the show in general looks very impressive. I’d heard that some exhibitors weren’t going to be allowed to attend due to being bad payers but as far as I can see all the major players are there and some marquees look very very impressive. When I ran our business we always stopped at the size you could put up without machinery so to see some of these huge structures being erected is fascinating. Anyway, enough of that, what are we going to be offering you this year? 2m x 6m Walkway – as mentioned previously we’ve started offering a modular 2m wide walkway. The number of times we’re asked for it means it should prove popular and an essential for any expanding marquee hire business. 6m wide deluxe marquees – Initially only available as a 6m x 12m marquee even though we’re displaying it at the show as 6m x 8m (we don’t have endless space, you get the idea!). These marquees are 2.3m high at the eaves making them the same height as aluminium frame marquees and feel a little more spacious walking in. They will also have 650gsm PVC roofs and 500gsm side panels but they’re not finished yet so the 6×8 has the standard 500gsm roof & 380gsm side panels. Do I think it’s worth having this extra thick roof? Honestly? not really, the big appeal to me is the added height but some people out there base everything on the thickness of material rather than other factors so we have to offer something thicker. Coloured linings – bit of a cheat as it’s not new, we’ve always made coloured linings but having a purple interior to our pagoda sounded quite eye-catching. Hopefully in a good way..
Starlight roof linings – We’ve started supplying these always popular black twinkling roof linings. Again, something different for you to see and offer your customers next year. They come in 6m x 2m sections so you can use them across our whole range of 6m wide marquees. 9m wide aluminium frame marquees – my God some work has gone in to these. And is still going on in fact, it’s a bit of a race against time over the next 24 hours but we should have some framework and covers for you to see. The next step for any expanding marquee hire business is to go bigger, and that means using an aluminium/steel combination to go 9m wide. We’ve developed these to be compatible with others in the market so even if you’ve already got some this could be of interest. As always thanks for reading, I hope to see you at the show – the forecast is mixed so have those waterproofs I mentioned a while ago handy just in case. Remember – Avenue E, stand 267. Half way up on the right or just two along from the HUGE black/silver marquee. As a marquee hire business your busiest months are generally June, July & August with the end of May and beginning of September also very popular. As suppliers to the hire industry our busiest months are obviously just before that (depending on how organised you are with ordering!) so our peak is April, May & June. Consequently we’re very busy at the moment and the blog might suffer a little. Our new 4m x 6m Marquee proved very popular on eBay, we’ve got to see how many we’re going to have spare but I’d imagine we’ll put another one in a few weeks time. We had a slight accident involving the lawn mower and the tie downs, the tie downs have been replaced but we’ve got to repair a couple of the exterior eyelets before we sell it, they’re very small and there’ll only be discrete patches (2″ square?). A little embarrassing.. The tie downs and lining roof come with it. The chandeliers are already sold to a hire company and the red carpet we’re planning on using as a walkway for my brothers wedding but if someone really wants it they can make an offer for it. It may seem like it with the posts last week and this week but I’m not just using this blog to advertise the marquees we have for sale, it’ll be back to normal next week. Buy a marquee for 99p! Well okay, it probably won’t stay at 99p but someone should pick up a bargain. 2. It’s cheaper to make it so all 3 knuckles (eaves and apex) are the same! This is actually why some of our cheaper rivals have higher roofs than standard. We can always make linings for it if required. 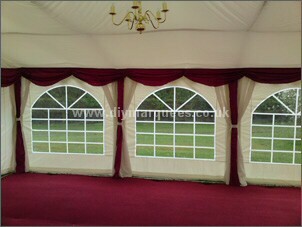 Posted in marquee sales, marquees for sale, party tents | Comments Off on Buy a marquee for 99p! DIY show marquee now up! For those who want to see before you buy and can’t wait for the Showmans Show in October we’ve currently got a show marquee up in a garden 10-15 mins away from our factory. It’s a 6m x 12m DIY Marquee though as we use the same design for all it’s useful to see even if you’re buying one 6m, 8m or 14m long. We’ve got our new chandeliers in there and the new carpet that we’re stocking (details and prices should go on the website later this week). We’re very excited about offering these new products, they seem to have gone down very well and as people will see from the show marquee give the marquee an excellent finish. When you think that this marquee costs around Â£1800 + VAT (excluding coloured swags) and hires out for Â£800-Â£1200 a time you really see how profitable marquee hire can be! If you want to come and see the show marquee please phone ahead for an appointment, it’s in someone’s garden so we could do with knowing the day before to be polite. Posted in marquee sales, marquees for sale, showmans show | Comments Off on DIY show marquee now up! When I suffered my back injury and realised I had to go into marquee sales rather than marquee hire I started to do some research.  Basically I picked the brains of mates in the industry, various contacts and searched round for what the current options were. The boundaries are getting greyer and greyer but people clearly differentiated between ‘party tents’ and ‘commercial marquees’. 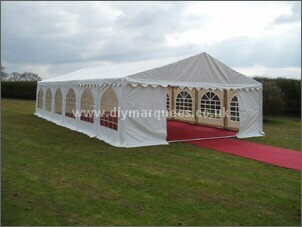 By general opinion party tents were made from thin PE material, were a budget option and had….powder coated framework. Commercial marquees were always seen to have PVC covers, be more durable and long lasting and always used..galvanised metal framework. Visiting a friends marquee hire business really made up our minds -he had a mixture of powder-coated and non-coated framework and after just one season the powder-coating was scratched and chipped. The galvanising looked better simply because it still had a uniform finish. As he said if people want a marque for anything other than a cover out of the elements then they’ll use an interior lining anyway. I think most people would think a powder coated framework is superior when brand new. But our marquees are built to last a long time and after a few uses when that powder coating becomes scratched and peeling nearly everyone would agree galvanising’s a better option. That’s why we use galvanising.